To be celebrated with our brother and sister Christians in Ambleside with a Communion and imposition of ashes at 7:00pm in St Mary’s Ambleside. Simple lunch at The Baptist Church on Compston Road. All welcome. No charge; donations to the work of Christian Aid among Refugees. “Lectio Divina” Fr Kevan Dorgan leads a course in this ancient monastic practice which is becoming more appreciated again in today’s world – in Mater Amabilis, Wansfell Road at 7pm every Tuesday during Lentunder the auspices of CTAD – Christians of all denominations welcome. Mothering Sunday. Luke 2, 25 – 40. The childhood of Jesus and insights into the life of the holy family. The service will be shorter than usual with accessible songs and liturgy. We hope this will have something to say to people of whatever age. Children present will be able to bring their mothers (and other ladies present) the gift of a posy. Our deep thanks to the Meschino family for providing these in memory of Jilly. This year we will also be thanking God for the safe birth of Eden White, who will be baptised during the service. Luke 19, 28 – 44, with the opportunity for those who wish to carry branches around the church building in the traditional re-enactment of The Triumphal Entry. 7pm Meeting with Communion in the Upper Room at Little Langdale Chapel. (150 yards past the Three Shires Pub on your right). Meet up by High Close Youth Hostel at 9am to carry the cross to Ambleside via Loughrigg Terrace and Rydal Hall. 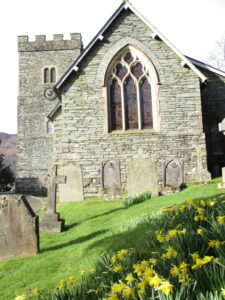 At Ambleside we meet up with others in Churches Together at 11am as we tell the Passion story in Bible readings and hymns around the village. 6am Dawn Service – entering the darkened church by candlelight and emerging at dawn to celebrate communion on the front porch as the sun rises. Breakfast in the Vicarage afterwards.